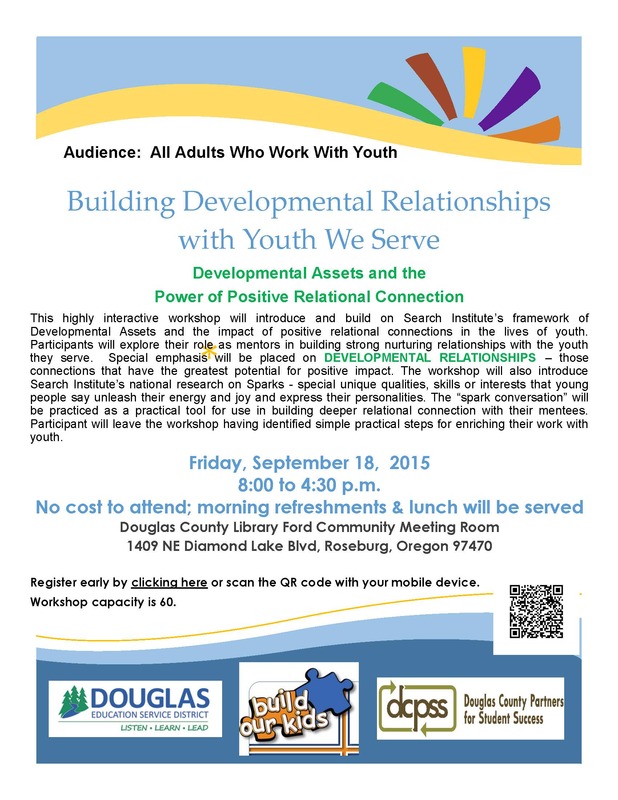 This highly interactive workshop will introduce and build on Search Institute’s framework of Developmental Assets and the impact of positive relational connections in the lives of youth. Participants will explore their role as mentors in building strong nurturing relationships with the youth they serve. Special emphasis will be placed on DEVELOPMENTAL RELATIONSHIPS – those connections that have the greatest potential for positive impact. The workshop will also introduce Search Institute’s national research on Sparks – special unique qualities, skills or interests that young people say unleash their energy and joy and express their personalities. The “spark conversation” will be practiced as a practical tool for use in building deeper relational connection with their mentees. Participant will leave the workshop having identified simple practical steps for enriching their work with youth. This event co-sponsored by the Douglas Education Service District, Build Our Kids and DCPSS.